The invention of the telephone still remains a confusing morass of claims and counterclaims, which were not clarified by the huge mass of lawsuits to resolve the patent claims of commercial competitors. The Bell and Edison patents, however, dominated telephone technology and were upheld by court decisions in the United States. Bell has most often been credited as the inventor of the first practical telephone. Alexander Graham Bell was the first to patent the telephone as an "apparatus for transmitting vocal or other sounds telegraphically". The telephone exchange was an idea of the Hungarian engineer Tivadar Puskás (1844 - 1893) in 1876, while he was working for Thomas Edison on a telegraph exchange. Before the invention of the telephone switchboard, pairs of telephones were connected directly with each other, practically functioned as an intercom. Although telephones devices were in use before the invention of the telephone exchange, their success and economical operation would have been impossible with the schema and structure of the contemporary telegraph systems. A telephone exchange was operated manually by operators, or automatically by machine switching. It interconnects individual phone lines to make calls between them. The first commercial telephone exchange was opened at New Haven, Connecticut, with 21 subscribers on 28 January 1878, in a storefront of the Boardman Building in New Haven, Connecticut. George W. Coy designed and built the world's first switchboard for commercial use. The District Telephone Company of New Haven went into operation with only twenty-one subscribers, who paid $1.50 per month, a one-night price for a room in a city-center hotel. Coy was inspired by Alexander Graham Bell's lecture at the Skiff Opera House in New Haven on 27 April 1877. In Bell's lecture, during which a three-way telephone connection with Hartford and Middletown, Connecticut, was demonstrated, he first discussed the idea of a telephone exchange for the conduct of business and trade. Old wall crank telephone telephone antique. Vintage rotary telephone, architecture buildings. Professor Bell in Lyceum Hall, Salem, addressing a party of scientific men in Boston / From sketches by E.R. Morse. President-elect Grover Cleveland holds a telephone receiver to his ear. Behind him on the wall is a portrait of President Chester A. Arthur captioned, "Pres. of U.S. till March 4, 1885." "Here's a health to the mugwumps, who helped in the strife, and have made this the happiest day of my life!" / F. Opper. Don't they wish they had never taken hold of it! / J. Keppler. Photograph shows George Witherell's lifeless body hanging from a telephone pole in Canon City, Colorado; a crowd stands nearby. Hello Central! / photographed and published by B.W. Kilburn, Littleton, N.H. Girl holding doll and making telephone call. Divine right vs arbitration / K.
The Bell Telephone office at Hamburg, N. Y. Photograph shows an interior view of telephone office with four workers; two women operators work at switchboard. Photograph shows a young woman, standing, posed using wall mounted telephone. Small girl seated on man's lap, wall telephone in background. Shows child in living room about to use telephone. Photograph shows little girl sitting in chair with dog and holding telephone receiver to dog's ear. Portrait of Prof. C.W. Roush, principal of the Broken Bow Business College, and his stenographer, Miss Mable Holcomb. She is typing; he is at desk surrounded by various appliances, telephone, fan, hot plate, percolator. [William Howard Taft, three-quarter-length portrait, seated facing left, on telephone] / copyright by Harris & Ewing. Photograph shows a woman, wearing fancy hat and dress, seated at a small table in the parlor, holding a rose, and posed using telephone. Photograph shows young woman using wall mounted telephone. Man in office on telephone with disappointed look: "--my mother--"
Man in office on telephone with disappointed look: "Is this you, John?" "Yes." "Well--"
Photograph shows young woman, wearing fancy dress, posed with hand holding onto telephone receiver on desk and transmitter (mouthpiece) to mouth. [Joshua W. Alexander, Democrat Congressman from Missouri, half-length portrait, seated with candlestick telephone in hand] / National Photo Co., Washington, D.C.
William Howard Taft, three-quarters length portrait, facing front, using telephone. 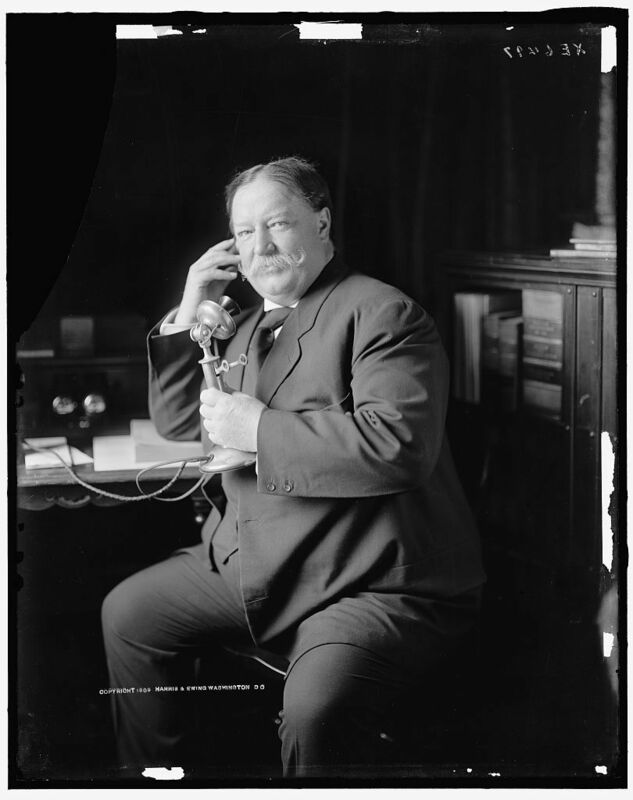 [William Howard Taft, three-quarter-length portrait, seated, facing front, smiling while talking on a telephone as he receives news of his nomination as the 1908 Republican presidential candidate from President Theodore Roosevelt] / Harris & Ewing, Washington, DC. [William Howard Taft, three-quarter-length portrait, seated, facing left, talking on a telephone as he receives news about his nomination as the 1908 Republican presidential candidate from President Theodore Roosevelt] / Harris & Ewing, Washington, DC. Photograph shows young woman, wearing lacy dress, seated, posed using telephone. Photograph shows a woman, wearing large hat and fancy dress, seated, posed using telephone. Photograph shows young woman, wearing lacy dress, posed using telephone. Photograph shows a woman fancily dressed, seated at a table, holding an umbrella and posed using telephone. Bust of woman, facing left, wearing earphones and a mouth piece. Telephoning his safe arrival in Pasadena to friends.